If you’ve got self-worth, you’ve got everything you need. You can change your life. Change your life. Change your family. And even change your world..
Because I am so determined to empower families and their children to cultivate deeper connections, a strong sense of self-worth and confidence. Because of my own personal journey, this topic is one I feel so passionate about and with a deep sense of purpose it is my mission to inspire and help young children develop higher levels of self-confidence and self-esteem. It is during childhood where we are able to form relationships that have the potential to influence and shape our lives. It’s where we develop belief systems about ourselves and the world around us and where we learn the skills that set us up for a healthy, vibrant and happy life. I remember as a child struggling so much with feeling different, stupid and unworthy because I had dyslexia. Teachers didn’t pick it up, my parents didn’t pick it up. I simply slipped through the cracks, however, I was smart and creative enough to muddle my way through school. Unfortunately, this belief about myself led me on a destructive path for me in my teenage years which only fueled my low self-esteem. Even though my “flaw” led to one of my biggest career achievements in life, the sticky unworthy residue of fear remained. I wrote about this part of my journey here . So you could imagine, when a mother whose 8 year old child is experiencing bullying as a result of her dyslexia personally messaged me via Facebook, made me feel inspired and determined to write this blog to show others it’s okay to be different. This amazing young girl is empowering herself by writing a book about being Dyslexic with the help of her teacher. This should be embraced and celebrated! Being different or unique should make us feel special. It means you have gifts and talents that if looked after can change your life for the best. I told that beautiful girl that I want to be the first one to buy her book! Dyslexia (www.dyslexiatas.org/) is a learning difference that affects a person’s ability to develop language skills, particularly reading and spelling. Often misunderstood for a lack of intelligence, dyslexia is actually not related to intelligence. It occurs simply when children’s brains process information differently and for this reason, children with dyslexia learn differently. When learning differences are seen as a weakness or when children are made to feel different for their uniqueness it can really knock their confidence and self-esteem often resulting in all sorts of self-destructive behaviours later in life. When growing up, its so easy to feel we need to “fit in” or be like the others or feel a need to fit the mold when really, thinking differently needs to be embraced and nurtured. Conquering fears and outside pressures from others does not need to be a lifetime battle..
With simple strategies and by being a positive role model, we can successfully teach and show our children by example how to love themselves for exactly who they are, feel comfortable with their differences and embrace their imperfections and flaws. 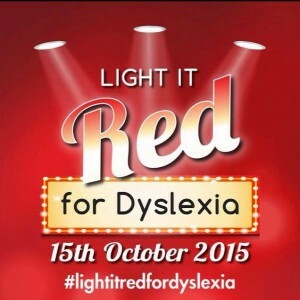 This month is ‘Light it Red for Dyslexia’ which is a fantastic national initiative, driven by volunteer groups around Australia as a pre-launch to Dyslexia Empowerment Week 2015. Significant monuments and landmarks across Australia with be lit up in red to raise awareness. For more information please go to the Square Pegs Tasmania Dyslexia Support & Advocacy Facebook page. I write a lot on these topics on my blog here . Learn ways you can teach your children how to deal with self esteem and embrace their flaws here. Have a week of wonder!